The Millennium Bug or Y2K was a psyop to ensure the world was wired for Rothschild's global electronic monetary system; a draconian Big Brother control mechanism more terrifyingly effective than British redcoats. The worldwide monetary crisis and planned collapse of the fiat monetary systemwith inflation, deindustrialization, unemployment, depression, poverty, homelessness, war, famine, disease and death; and within the inassimilable multicultural demography of our apostate once homogenous Christian nations, division, hatred, anarchy and deathfruit of Khrushchev's "peace offensive" launched in 1956 to put the "bourgeoisie to sleep," so that the final take-over of the entire world by the Judaeo-Communism succeeds through the element of surprise. 1956 was the jubilee year of the Laodicean Church Age, the year in which the United States rejected her last opportunity for national repentance. "And while the Bridegroom tarried through the Church Ages, they all slumbered and slept"; since His return, the foolish virgins have come out of Rome and her (once) Protestant daughter churches, and are now in the circle of this Message, asleep behind the pulpit or in the pews. The planned monetary collapse and worldwide depression is intended to decimate the middle class, whose intellectual and material independence (like private ownership of hand guns), is viewed as a threat by the international criminals who desire world hegemony. Monetary collapse is intended to force "a global level playing field" wherein all but a tiny elite are returned to serf-like submission by the masters of the universe. After earthquakes sink Los Angeles and much of California, which is the world's seventh-largest economy, the US dollar will fail. With the US militarily exhausted, already defeated in Iraq and Afghanistan, Russia will invade mainland USA. Rome will intervene in union with other religions and restore peace; as Russian occupation forces withdraw the world will implore Rome's then Devil-incarnate pope to take presidency over one world government. In league with the Jewish banksters she will refinance the dollar with gold backing and return the nation to prosperity as ancient Laodicea was restored following its devastating earthquake. In view of the likely degradation in the economic, financial and security situation wherever you live, and as a precaution, families might act now to set aside a stock of non-perishable foodstuff (without the knowledge of children, neighbours, or anyone outside the home). Residents of the United States may recall that at the time of Y2K it became a criminal offence for homes to maintain more than two week's supply of food, so don't show, and don't tell. Because of the earthquake he had prophesied, Brother Branham warned Christians decades ago that they should move from California. I suggest that Brethren living on the eastern seaboard of Pacific and perhaps also the Indian Ocean should move to higher ground before this time of the year. Pay up any lingering debts, pray up, and keep the Token on display. I encourage you to review Brother Branham's sermon, "Christ is the Mystery of God Revealed," which is the essence of the last Book of the Bibleunveiling God in Jesus Christ. This will complement our teachings The Creation of God and His One Eternal Purpose. The transformation is being accomplished by grace through faith in God's revealed Word. The US money center banks . . . are all deemed to be too big to fail. But . . . Goldman Sachs is using about $US40 Billion of equity as the foundation for $US1.1 TRILLION of assets. That comes to a "gearing" of 27.5, which is the same as saying that were $US40 Billion of its loans to go sour, and then Goldman Sachs would have lost ALL its capital. Over at Merrill Lynch, which is now the most leveraged, $US1 TRILLION of assets is placed on a foundation of around $US30 Billion of equity. That's a "gearing" of 33.3, which is the same as saying that should about 3 percent of its loans go sour Merrill Lynch would be stripped bare of its capital. There are no safety margins here at all. The US money center banks are cardboard houses. If they had to take their "balance sheets" to the marketplace to seek credit, they would be summarily refused . . . US manufacturing base takes up a mere 9.9 percent of total employment. If the gargantuan and grotesque US military-industrial complex is subtracted, as it ought to be as sheer economic waste, what would remain are those still employed in the US civil and private economy. In reality, genuinely productive employment in the US economy is much lower than 9.9 percent . . . Any comparative analysis places the US in the third world category in real physical economic terms. What identifies a modern nation today is the gearing between industrial capacity and the percentage of the workforce employed there . . . REAL capital cannot be consumed with impunity. Once it is gone, it no longer exists. As an economic power, the US is done. In the three months to January, world trade in goods rose at annualised rate of 0.2 per cent over the previous three months. The equivalent growth rate in the three months to October 2007 was 6.9 per cent. Note the difference between these two quarterly numbers, from 6.9 percent to only 0.2 percent in the following quarter; three months more of this and global trade will be in free fall. This is an excerpted quote from US House of Representatives member Ron Paul: Total US government obligations are $US 53 TRILLION, while total net worth of US households is just over $US40 TRILLION. The country is broke. This statement by Mr Paul is fully authoritative. He has been on various House of Representatives finance and banking committees for decades, so he knows. What this means in basic accounting terms is that the assorted levels of US government have so loaded the US civil economy with debts that even the forceful expropriation of the full net worth of all Americans will not be enough to bring the US back to a state of solvency. Further, this overhang of debts only deals with official US government debt. The private debts of Americans are not included at all in Mr Paul's calculation. All these private debts have to be added on top. The general US media is an amazing system. Over the last three months or so, it has managed to reduce its coverage of the ongoing fighting in Iraq between the US occupation forces and the Iraqi resistance to only three percent of its national coverage. That includes print, television and radio news, according to reliable US media watching organisations. Iraq coverage has been replaced with Obama and Hillary. With more than 730 military bases spread across the world, as recorded by the renowned historian Chalmers Johnson, the US is a de-facto global empire. These US bases are still expanding regardless of the failing wars in both Iraq and Afghanistan. During President Bush's presidency, NATO itself has added seven new membersBulgaria, Romania, Slovakia, Slovenia, Lithuania, Latvia and Estonia, bringing the number of US NATO allies to 26. While the US economy is caving in behind him, President Bush has rolled out not only his two wars but also vastly extended his alliance and global bases system. America's ongoing reliance on imports of foreign capital is continuing. Though the current account deficit shrank in the fourth quarter, it was still 5.3 percent of US GDP last year. This continuing military buildup is a strategic move counteracted by the backwards pull of the US financial and economic recession. It is a geo-political and geo-strategic absurdity. It is the strategy of assured future collapse. . . this is the turning point around the vast pivot which was the US economy. This pivot is now crumbling. The most important centre point of the post WW II world has been undone. After this false lull, there are tumultuous events ahead financially, economically and geo-strategically. The US banking system has poisoned the well from which the US Treasury borrows by selling international lenders American subprime waste paper. These lenders are facing losses which are climbing ever higher. The Bank of China, hardest hit among the country's big banks by subprime exposure, has reported that it held $US5 Billion in US asset-backed securities at the end of 2007 and booked $US1.58 Billion in losses and markdowns on the holdings. China's Industrial & Commercial Bank reported holdings of $US23 Billion in US subprime paper at the end of 2007 and booked $US400 million in losses. Suffice it to say that Chinese banks are not keen to keep loading up on US debt paper. In Shanghai, China's benchmark CSI 300 Index recently plunged 5.1 percent to its lowest point in eight months. The index has slumped 30 percent this year on Chinese concern that a housing crisis would push the US economy, China's biggest export market, into recession. This is the way that the US economic recession is spreading like waves right across the world's stock markets, causing losses which are already in the $US TRILLIONS for investors globally. That, of course, will have its own effects inside all these economies. Falling stock markets are always economically contractionary. With the Asian nations most exposed to the internal US consumer markets, the US contraction will occur in Asia to a near matching degree. For several of these nations, this will be enough to knock them into real economic recession. Of course, with these Asian nations having rolled into their own recessions, they will buy less as their imports diminish. This too will be a form of economic backwash from the US recession wave. No nation will be immune; the entire world economy faces an economic downswing. As the economic wave sweeps across the globe, it is certain that those with the reserves in hand will be using parts of these reserves to sustain their own economies during the downswing. This simple fact makes it certain that Asian economies will periodically engage in selling waves of US Dollars. They will try to time these sales during periods of temporary US Dollar strength. But that, in turn, means that any upturn in the US Dollar will be capped by this Asian selling. The US Dollar simply cannot win. On Monday, March 24, Iran's Foreign Minister announced that his country has officially applied to join the Shanghai Cooperation Organization (SCO), a security grouping of nations dominated by China and Russia which has morphed into a form of anti-NATO alliance. Iran would never have made this official announcement had in not known in advance that it had the approval of both Russia and China. Geo-Strategically, this simply means that if and when Iran joins the SCO, then it has acquired two enormous and powerful allies in full military terms. The first is Russia, with a nuclear armament sufficient to be equal to that of the US. The second is a greatly modernised China with its own vast armed forces. In this alliance, it will be China and Russia calling the shots diplomatically and/or militarily. Iran will be the very junior partner. But the important point here is that with Iran as a member of the SCO, any US future attack upon Iran has become void. . . In practical terms, the futile US military enterprise is all over, unless the Bush Administration is prepared for a global war. President Bush travelled to Moscow last week as a "supplicant," having insufficient military and strategic means in hand to retrieve the drastic situation inside Iraq. The US military occupation of Iraq is right on the verge of full military failure. The US Force on the ground there has utterly exhausted itself and it cannot for much longer be maintained logistically. President Putin knows this. So do the Chinese who stand right behind him. Arriving in Russia, President Bush will discover the real cost of a policy which has left the US in an impossible worldwide position. Mr Bush faces a parallel situation to what President Gorbachev faced in 1991withdraw or collapse . . . For example, the US Army has worn out about 40 percent of its equipment through use or battlefield destruction. It would take at least $US240 Billion to simply restore the US Army in terms of equipment to the state it was in before the March 2003 attack on Iraq . . . What was not clearly known until these past two weeks was that the US ground force was now actually losing its battle in Iraq and had in fact begun the processes of withdrawing. The US Army is now in a full retreat. Inundated with losses (and the write-down has only just begun), the Bush Administration will see a truly massive contraction in tax revenues from the US financial sector which will arrive right on the US Treasury's bottom line. Facing this, the US Treasury still has to send a climbing tidal wave of money over to the Pentagon to pay for the Bush wars. Woe to all the Western companies which have established export goods factories in China. They will soon be reporting not only falling earnings back to their headquarters but even losses as both the US economy and the general world economy slow towards the global recession. And the Chinese recession will come on top of that. This is the point at which the Chinese political powers that be will start making use of the huge foreign exchange reserves that China now holds. These total $US1.64 TRILLION in the economic "war chest" and China will use them to sustain its own internal economy once the Chinese economy really begins its dive into a deep recession. Toyota has already stopped making cars in two factories in the US. The general Japanese economy is following in train . . . while much of the so-called "developing world" is on the verge of collapsing into food riots, an amazing NINE PERCENT of the total population of the US are now relying on "food stamps" to eat. This in the "richest" nation on earth. The global credit expansion which is now imploding despite desperate efforts of central bankers and treasurers everywhere is, of course, devastating the world's so-called "real economies." What better proof of this could there be than the simple fact that the World Bank met last weekend to deal with the spectre of political unrest in 33 nations brought about by the high cost and growing scarcity of FOOD? Or the fact that almost one in ten Americans is dependent on food stamps? The "soup kitchens" of the 1930s are reappearing everywhere, and there is not enough "soup" to go round. . . . Full story: © 2008 - The PrivateerIssues 600 and 601. Comment: I do not expect the US dollar will collapse before earthquakes sink Los Angeles, wreaking global devastation, at the end of the Gentile dispensation. In face of this global catastrophe the persecution of the wise and foolish virgins who warn friends and loved ones of the tribulation and of the mark of the beast is assured. Authorities worldwide will introduce martial law, citizens will rally and churches unite for disaster relief. A successful Russian Invasion of the US mainland will follow perhaps six weeks after the earthquake. Los Angeles, April 14, 2008  New calculations reveal there is a 99.7 percent chance a magnitude 6.7 quake or larger will strike in the next 30 years. The odds of such an event are higher in Southern California than Northern California, 97 percent versus 93 percent. "It basically guarantees it's going to happen," said Ned Field, a geophysicist with the US Geological Survey in Pasadena and lead author of the report . . . More than 300 faults crisscross the state, which sits atop two of Earth's major tectonic plates . . . The analysis is the first comprehensive effort by the USGS, Southern California Earthquake Center and California Geological Survey to calculate earthquake probabilities for the entire state using newly available data. Previous quake probabilities focused on specific regions and used various methodologies that made it difficult to compare . . . For the Los Angeles Basin, the probability is . . . 67 percent. There is no past comparison for the Los Angeles area. Comment: Brother Branham prophesied, "Thou city, who claims to be the city of the Angels, who's exalted yourself into heaven and sent all the dirty filthy things of fashions and things, till even the foreign countries come here to pick up our filth and send it away, with your fine churches and steeples, and so forth the way you do; remember, one day you'll be laying in the bottom of this sea. Your great honeycomb under you right now. The wrath of God is belching right beneath you. How much longer He'll hold this sandbar hanging over that, when that ocean out yonder a mile deep will slide in there plumb back to the Salton Sea. It'll be worse than the last day of Pompeii. Repent, Los Angeles. Repent the rest of you and turn to God. The hour of His wrath is upon the earth. Flee while there's time to flee and come into Christ" (Choosing of a Bride, p. 35:5). "A prophecy that I made about 1935 . . . said: "The time would come that the sea would weep its way into the desert." Look what'll take place. If that thousands of square miles falls down into the lava of the earth and slides in, there'll be millions die at one time. And that'll cause such a tidal wave . . . Remember, plumb up into the Salton Sea is a hundred or two hundred feet lower than the sea level. That water will probably come almost to Tucson with that tidal wave coming across there. And the sea shall weep its way into the desert" (Trying to do God a Service, p. 6:25). 'Eurasia is home to most of the world's politically assertive and dynamic states. All the historical pretenders to global power originated in Eurasia. The world's most populous aspirants to regional hegemony, China and India, are in Eurasia, as are all the potential political or economic challengers to American primacy. After the United States, the next six largest economies and military spenders are there, as are all but one of the world's overt nuclear powers, and all but one of the covert ones. Eurasia accounts for 75 percent of the world's population; 60 percent of its GNP, and 75 percent of its energy resources. Collectively, Eurasia's potential power overshadows even America's. 'Eurasia is the world's axial super-continent. A power that dominated Eurasia would exercise decisive influence over two of the world's three most economically productive regions, Western Europe and East Asia. A glance at the map also suggests that a country dominant in Eurasia would almost automatically control the Middle East and Africa. With Eurasia now serving as the decisive geopolitical chessboard, it no longer suffices to fashion one policy for Europe and another for Asia. What happens with the distribution of power on the Eurasian landmass will be of decisive importance to America's global primacy' . . . It's about global hegemony, not democracy. It should be no surprise when powers such as China are not convinced that giving Washington such overwhelming power is in China's national interest, any more than Russia thinks that it would be a step towards peace to let NATO gobble up Ukraine and Georgia and put US missiles on Russia's doorstep "to defend against threat of Iranian nuclear attack on the United States." The US-led destabilization in Tibet is part of a strategic shift of great significance. It comes at a time when the US economy and the US dollar, still the world's reserve currency, are in the worst crisis since the 1930's . . . The dire warnings from the International Monetary Fund this week that the West now faces the largest financial shock since the Great Depression, while the Asian economies are still powering ahead, simply underlines our vulnerability in this new world order. The desperately weakened American dollar appears to be on the verge of losing its global dominance, in the same way as sterling lost it a lifetime ago. . .
Last month, an Indian company, Tata, bought up what was once the cream of British manufacturingJaguar and Land Rover . . . The Malaysian company Proton owns Lotus. Indian company Tata owns Corus, once British Steel, as well as Tetley Tea . . . In Lubumbashi, the capital of the Congo's copper-rich region Katanga, the Economist reported "a sudden Chinese invasion." Troubled Angola recently shunned Western financial aid because of the amount of Chinese money pouring into it, in return for commodities. "The princes of business and industry and the earls of the ecology fabricated global warming as a devise to redistribute the wealth of the world . . ."
It is not likely the IPCC, the eco-idiots behind the global warming scare tactics, and the watermelon bureaucrats who are using climate change to implement totalitarian controls over the people of the world, are going to do anything soon to rectify the situation. With carbon dioxide classified as a hazardous pollutant, the watermelons will soon see the doomsday prophecies of Paul Ehrlich come true, as greatly reduced levels of carbon dioxide bring about massive food shortages as crop yields are radically reduced because carbon dioxidethe food crops eathas been dramatically curtailed by federal regulation, and the air quality over the largest industrial centers will have become so bad respiratory illness will become world's deadliest and most prevalent killer. In the end, the lunatic rantings of the eco-idiots will become fact. God's one eternal purpose is now being achieved by faith in His revealed Wordtransforming His secret unseen thoughts to sensible reality that you can see with your eyes and handle by your hands, taste, smell and hear in fellowship. God is love, and His thoughts are the glorious Attributes of what He is, so in order to love and be loved and worshipped, He placed men on free moral agency that they may choose to reciprocate His love and reflect His likeness, becoming His glory and eternal Life, or desist and cease even from memory. First, by revealing the fullness of His nature and character bodily in Jesus Christ, the Perfect Man, born of a woman that He might identify Himself with us and qualify as kinsman Redeemer for Adam's fallen race to restore an election from "few days, and full of trouble" to an eternity of peace (Job 14:1; Revelation 21:1  22:7). Second, to reproduce the stature of the Perfect Man in His Body of believers whose sin-born flesh is a continuation of the first Adam, that He might have preeminence in His Bride whose soul is the continuation of the last Adam, who is the beginning of the new creation of God. This last Eve will obey her Husband in everything (Ephesians 5:21-33), that He might express Himself in His Family of God-men in the manifestation of the Sons of God. Third, to restore the Kingdom to its rightful position of fellowship in His Presence whence it fell when the first Adam crossed over the time line and the Life line to redeem his fallen Eve (Romans 5:12-21). That is, to be worshipped throughout eternity in the form of New Jerusalem, His glorified Family, Jesus Christ and His Bride in the midst of the paradise of God. Hebrews 11:3, "Faith is the confident assurance of the actual existence of things hoped for, the conviction of unseen realities . . . By faith Enoch was translated that he should not see death; and was not found, because God had translated him: for before his translation he had this testimony, that he pleased God. But without faith it is impossible to please Him: for he who comes to God must believe that He exists and that He is a rewarder of those who diligently seek Him" (Hebrews 11:1, 5-6). Paul again defines faith in I Corinthians 2:9-16, "According to Isaiah 64:4, No eye has seen, nor ear heard, neither has the human heart conceived the things God has prepared for those who love Him. But God has revealed them to us by His Spirit: for the Spirit searches everything, even the depths of God. For among men who knows a person's thoughts, except his own inner spirit? Similarly, no one knows the thoughts of God except the Spirit of God. And we have received, not the spirit of the world, but the Spirit that comes from God, in order that we may know the things which God has freely given us. And we impart this in words not taught by human wisdom, but in words taught by the Holy Ghost  interpreting Spiritual truths to spiritual persons. But the natural man does not receive the things of the divine Spirit: for to him they are folly, and he cannot understand them because they are spiritually discerned. The Spiritual man, on the other hand, judges all things, yet he himself is judged of no man. For who has known the mind of the Lord so as to instruct him? But we have the mind of Christ". God being perfect wishes to display His Attributes, which are His thoughts, not my thoughts or your thoughts, in order to gather glory (adoration and worship) to Himself alone. Matthew 4:4, "Man shall not live by bread alone, but by every Word that proceeds out of the mouth of God." Since a Word is a thought when it is expressed, we must offer to God the sacrifice of His thoughts, giving thanks in the Name of our Lord Jesus Christ. Philippians 2:5; 4:8, "Let this mind be in you, which was also in Christ Jesus [and] whatsoever things are true, whatsoever things are honest, whatsoever things are just, whatsoever things are pure, whatsoever things are lovely, whatsoever things are of good report; if there be any virtue, and if there be any praise, think on these things". God is accomplishing His one eternal purpose by grace through faith unmixed with man's interpretations. This means that every son and daughter of Adam who encounters the Word for their day has the opportunity by the exercise of their free moral agency to be one of the Attributes in the glory of God before the world wasbefore the Logos was expressed by the great eternal Spirit who was not yet God since none of His creative thoughts were manifested to worship Him as God but existed only as foreknowledge (John 17:5). Psalm 147:10-11, "The Lord takes no pleasure in the legs of a man. The Lord takes pleasure in those who fear Him, and hope in His mercy." God is God. He seeks to gain glory to Himself, and will not share His glory with another. We must offer back the sacrifice of His thoughts by faith, not the works of our own mind and hands which are vain imperfections. Once God dwelt alone with His thoughts; now He is transforming His thoughts from Spirit into the glorified material form of Himself in the many-membered Body of Jesus Christ, Husband and Wife, who are one in the Logos as Jesus prayed in John 17:22-26 (I Corinthians 12:4-27; Ephesians 5:20-33). His eternal thoughts are the Attributes of what He is: Spiritual genes of His loins so to speak, and eternal Life unless and until hybrid unto death (John 6:63; Revelation 22:18-19). His gene is Spirit and it is eternal Life (John 6:63). Jesus said, "The seed is the Word of God" (Luke 8:11; Isaiah 55:11). His Word is Spirit in a form we can receive by faith. However, God chose to first manifest the natural gene that would fall, and secondly to manifest that which is Spiritual, the Lord from heaven, to redeem earthy man; that seed cannot fall (Matthew 24:24; John 2:19; 6:39). Even before "the beginning" the Sons of God existed in His thinking. Job 38:4-7, "Where were you when I laid the foundations of the earth? Tell me, if you have insight. Do you know who determined its dimensions, and who did the surveying? Upon what were its foundations sunk, or who laid the Capstone, when the morning stars sang together, and all the sons of God shouted for joy at the revelation of the Seven Thunders"? In God's foreknowledge Christ was slain for the sins of the world, and before there was a star or an atom the Sons of God were written in the Lamb's Book of Life (Ephesians 1:4; Revelation 13:8). Those names can never be removed because that Book is "forever settled in heaven," and was "sealed to the time of the end." On March 8, 1963 Christ claimed the Book and opened its Seven Seals then "finished the mystery of God" by revealing the through "his angel" William Branham between March 17-24 (Daniel 12:4, 9; Revelation 1:1; 3:14; 4; 5; 10:1-7). Christ is the mystery of God revealed, and as His Bride was eternally in the Logos or Word, the mystery is who they are, and how He redeemed them in each Age of the Gentile dispensation. Since the revelation of the Seven Seals, the members of Christ's end-time Bride know their name is written in the Lamb's Book of Life. When a Church Age saint received the revelation of his 'Thunder' which was the Voice of God calling his name from the Lamb's Book of Life by the Message to his Age. All seven Church Ages are over; in this holy convocation we have received the revelation of all Seven Thunders. That revelation interpreted as a "written epistle" in your life is the manifestation of the Name of God, the Token of the Life of Christ on display in you, which is the evidence of your new birth. The Lord raises His children as we raise our children, with reward for good behaviour and chastisement for missing the mark of the high calling. Since the Fall He has seldom appeared openly, but veiled Himself in shadows and types. Even when He was on the platform with Brother Branham the congregation could not see Him, yet His Presence was manifestly known, and those who reached out in faith touched Him and were touched by Him. When the children of Israel sinned He placed them under the Law which defined sin and found all men guilty (Romans 5:13, 18, 20). This justified chastisement with a view to correction enabling God to manifest His Attributes of love, mercy and redemption to His elect in the propitiatory death and victorious resurrection of our Lord Jesus Christ; justified by grace we offer ourselves a living sacrifice by faith. This likewise enabled God to manifest His Attributes of justice and wrath upon recalcitrant sinners. Hebrews 10:1, "For the Law having a shadow of good things to come, and not the very image of the things, can never with those sacrifices which they offered year by year continually make the comers thereunto perfect. . ."
So if "the Law is spiritual," containing the shadow "of future good things," let us strip off the veil of the letter spread over it and consider its naked and true meaning. The Hebrews were commanded to furnish the Tabernacle as a type of Christ's Bride that they might be able by means of sensible things to announce beforehand the image of divine things. For the pattern which was shown to Moses in the mount, to which he was to have regard in fashioning the Tabernacle, was a kind of diagram showing the way back to the Presence where God dwells, which we now perceive more clearly than through types, yet more darkly than if we saw the reality. For we cannot yet in our present condition bear the sight of pure immortality, just as we cannot bear to look upon the rays of the sun. Israel beheld the patterns of things in the heavens, of which Christ's Bride is the as yet unfinished image of the heavenly order, the true tabernacle "whose builder and maker is God," and will be manifest in the resurrection. Galatians 3:24-25, "Wherefore the Law was a schoolmaster to bring us to Christ, that we might be justified by faith. But after faith has come, we are no longer under a schoolmaster". Being made in the Image of God (living souls) man needed to receive that which was according to His Likeness; which was the Word being sent down into the world to perfect the character of His elect, to save penitent sinners and condemn unbelievers. He first took human form, disfigured as it was by many sins, in order that we, for whose sake He bore it, might be able again to conform to the divine Likeness. For we are truly fashioned in the likeness of God only when we re-present His features in a human life, like skilful painters, impressing them upon ourselves as upon canvas, learning the path which He showed us. And for this reason He, being God, was pleased to put on human flesh, so that we, beholding as on a blueprint the divine Pattern for our life, should also be able to imitate Him who painted it. For He was not one who, thinking one thing, did another; nor, while He considered one thing to be right, taught another. But whatever things were truly useful and right, He both taught and did. Under grace the saints are being disciplined for incorruption, for the Bible is the story of God changing His form from the eternal Spirit alone with His thoughts to the flesh of His glorified family. In the technical sense, a pattern is something in conformity with which a thing must be made; in an ethical sense, it is a dissuasive example of ruinous events which serve as admonitions or warnings to others; or an example to be imitated, such as the lives of the worthy heroes of faith in Hebrews 11; in a doctrinal sense, it is a type, for instance, a person or thing prefiguring a future person or thing like the glorified Son of David, the Son of man revealed in Brother Branham's ministry, New Jerusalem and the Bride of Christ. So God took from Himself the substance of the creatures formed, and the pattern of things made, and the type of all the adornments in the world. Being infinite, God knew all things from the beginning. And these, His eternal thoughts are the Attributes of what He is, expressed as Words; and the Words manifested His thoughts in material form. At the translation you will find out that heaven is not somewhere else; it's right here in another dimension faster than this. Matter is Spirit slowed down; thus when Christ opened the Seventh Seal, "the Lord came with ten thousand times ten thousands of His saints . . . [and] heaven was empty for the space of half an hour" (Jude 14; I Thessalonians 4:14; Revelation 8:1; 10:1). They are present now in another dimension; the veil of flesh prevents us from seeing them. If you are born-again, you are now seated in heavenly places in Christ Jesus, the Logos once manifest in flesh. Indeed, if you are elect of God you have been seated in heavenly placeswhich is the mind of Godfrom eternity, because before the foundation of the world, before the Logos was expressed, you were foreknown in Christ on Calvary; thus you are an eternal Attribute of the eternal Spirit we call God, and can no more be lost than God can be lost. It was on the strength of this revelation that Adam laid down his life to redeem Eve. God knew you before time and material creation came into being, and placed your name on the Lamb's Book of Life. First you were His creative thought in which form you existed eternally. Then, when you were born-again, you, your soul, was expressed as His Word; now as you mature in the faith you manifest the Word which is God (II Corinthians 3:2). This is illustrated by Psalms 139:15-16, "My substance was not hid from You, when I was made in secret, and intricately fashioned in utter seclusion. Your eyes saw Me before I was formed, and My members were all written in the Lamb's Book of Life, and fashioned in continuance, when as yet there was none of them". Brother Branham commented: this gives us the knowledge that the thought was there in His mind, and that thought was eternal and had to be expressed. So when Adam was formed of the dust of the earth and his spiritual being created by God, then Adam became God's thought expressed, and those eternal thoughts were now manifested. Down through the centuries we could go. We find a Moses, a Jeremiah, a John the Baptist, and each one of these were God's eternal thought expressed in its season. Then we come to Jesus the LOGOS. He was the perfect and complete THOUGHT expressed and He became known as the Word. That is what He IS and forever WILL BE. Now it says that "He has chosen us IN HIM (Jesus) before the foundation of the world." That means that we were right there WITH Him in the mind and thoughts of God before the foundation of the world. That gives an ETERNAL quality to the elect. You can't get away from that (An Exposition of the Seven Church Ages, p. 150:1-3). In the beginning God dwelt alone with His thoughts, and He was lonely. He will never be lonely again, for His thoughts are being made manifest. And you are hearing this sermon or reading this Newsletter because God is fellowshipping with you as the Attributes of His thinking made manifest and putting on His likeness as you conform to the faith. So you, by taking thought, cannot add one cubit to your stature. You cannot come to the Lord by your works. It is God, who shows mercy, and "All the Father has given Me will come to Me: no man can come except My Father draws him." Romans 8:29, "God's elect are predestinated to be conformed to the image of his Son." That is, to be His sons after the pattern, model, or image of His Sonship is reproduced in our character and nature. Enoch, whose name means "dedicated," was "the seventh from [the first] Adam;" the number conveying the idea of divine completion and rest, while he was himself a type of perfected humanity. "Enoch walked with God three hundred and sixty-five years and was not for God took him." Enoch who was called out of the seventh generation from the first Adam was a type of Christ's end-time Bride called out of the seventh Church Age or generation from the last Adam. Like Enoch, she will be translated without death. And the elect of all Ages will fulfill that complete day of a thousand years walking with the Lord as Enoch lived a complete year of three hundred and sixty-five days. However, all are not Enoch's, and as a mixed multitude followed Moses in the first exodus, a mixed multitude has come out of Babylon in the third exodus. God is separating His people by declaring the difference between revelation and man-made interpretation, to thin-down the crowd by unveiling Himself in those who are His Attributes, thus exposing those who only think they are. The revelation of the mysteries of the seven thunders is awakening the Bride while it passes over the heads of those who are not elect. The Holy Spirit used Brother Branham to speak in colloquial English as He caused Jesus to speak in common or 'koine' Greek in order to separate the intellectuals from those with discernment of Spirit and revelation. For instance, Brother Branham frequently said, "the Jews this," or "the Jews that" because this is what our English Bible says, just as it says "come" without distinguishing between a 'parousia' and an 'erchomai' coming. However, there was no such word as "Jew" in any Bible until the latter half of the eighteenth century, and the meaning of this new word "Jew" is the antithesis of the two words it has replaced, so when Brother Branham said "Jew," he invariably meant "Israelite." Teaching calls us to be particular in the use of language since we are endeavouring by the grace of God to "rightly divide" the Message of the Prophet so that the saints will have a clear understanding of what he meant rather that the "letter" of what He said. Brother Branham did not mention the term 'parousia' Coming; he employed the English "Coming of the Son of man." However, those with the Spirit and maturity will discern Christ's second or 'parousia' Coming in the Office of Son of man from His second physical return or 'erchomai' Coming in the Office of Son of David. (See Newsletter 518). Thus revelation by the Spirit of God will separate elect from non-elect. Jesus spoke in parables in order to thin-down His crowd. Matthew 13:10-17, "The disciples came and said to Him, Why do You speak to them in parables? He answered, To you it is granted to know the mysteries of the kingdom of heaven, but to them it is not given. For to him who has [faith] more will be given, and he shall have superabundantly: but whosoever has not will be deprived of whatever he has. This is why I speak to them in parables: because they look and see nothing; they listen and neither hear nor understand. In them is fulfilled the prophecy of Isaiah: You will listen and listen but not understand at all; you will look and look, and never see at all. For this people's heart has grown dull, and with their ears they hear poorly, and their eyes they have closed so that they may not see with their eyes, and hear with their ears, and understand with their hearts, and return to Me to heal them. But blessed are your eyes, for they see: and your ears, for they hear. For I assure you, That many prophets and righteous men have longed to see what you see and did not, and to hear what you are hearing and did not" (II Timothy 3:7; I Peter 1:10-12). Jesus told the seventy apostles, "Unless you eat the flesh of the Son of man, and drink His blood, you cannot have eternal Life in you" (John 6:53). He didn't explain it, because it was a revelation. And reasoning among themselves, they said, "This is a hard saying, who can comprehend what He means"? And without a revelation they deserted Messiah. In another place He commanded His disciples to baptize in the Name of the Father, and of the Son, and of the Holy Ghost. Yet there is no record of any baptisms in three Titles according to the "letter without the Spirit" until two centuries after the death of the apostolic saints. Scriptural water baptism has only even been in the Name of the Lord Jesus Christ, and unless you were baptized in the Name of the Lord Jesus Christ you have not been baptized in the NAME (singular) of the father, and of the Son, and of the Holy Ghost. Here again, we see the Lord thinning-down the crowd by revelation. The evidence of the Holy Ghost is your ability to receive the Word by a clear understanding, not some system. Once Jesus had overcome and made His decision in the Garden of Gethsemane the anointing left Him. He went to the Cross as a man, but also as God for He was the Logos of Jehovah expressed in flesh. Like the first Adam, He expressed Himself as male, the Husband, but His Wife was IN Him then, and if the Groom is the Word the Bride is the Word. So it is true that I was born of a virgin 2,000 years ago. God made me pay for my sin in Christ on Calvary, so when He looked down upon His Son, He saw both male and female. It was all redeemed in that one body, because God did not separate the Bride from the Groom until Jesus cried with a loud Voice, "It is finished! Into Your hands I commend My spirit." And as His spirit expired, His soul departed with the Holy Spirit from which God is forming His Bride. He returned to theophany and preached to the souls in prison, vindicating the Old Testament prophets and saints across the chasm in paradise. His body was interred in the tomb of Joseph of Arimathaea, and resurrected on the third day in glorified form for our justification (Romans 8:33-34). As a Christian you are not only forgiven, you are justified. Romans 5:1 says, "Being justified by your revelation you are in harmony with Christ the Word." Justified does not mean forgiven, it means you are righteous, as though you never sinned in the first place. When you were born-again the old union of your soul in fornication with the nature of the world, which is the nature of Satan, the god of this evil age, was annihilated (Romans 7:1-6). It died, you were released from the rule of that old de facto husband and the Bridegroom bore your shame on Calvary. He took your place in death because you were predestinated to be His Bride before the foundation of the world. That Word was judged once and paid the supreme penalty, and you were predestinated in Him so you can never be judged again, "for it is destined that men die only once" (Hebrews 9:27). John 5:24, "He who hears My Word, and believes on Him that sent Me, has eternal Life, and shall not come into condemnation; but is passed out of death into Life". You were not physically in Christ, nor was your soul in Him as there is no pre-existence of souls, but you are eternal with Him because before the foundation of the world, God saw you IN Christ crucified. By foreknowledge you were accounted in Christ by the baptism with the Holy Ghost, predestinated in Christ, and came from the same sourceHis eternal thoughtswhich are the Attributes of Himself (II Corinthians 5:13-21). Then you were born of the spoken Word for your day, and became the manifestation of His expressed thought as you acted out the revelation in your life. The same Word that spoke of the Groom also speaks of His Bride, so she will manifest everything that was promised of Him, even to raising herself from the dead, because this is written in His Word (John 2:19; 6:39). If we are God's children, we are His eternal Attributes and eternal Life. And because God is the only Eternal Life there is, we were in Him from the beginning; and when the fullness of the Logos was manifest as Jesus Christ, we were part of Him then. When you can see yourself in Christ on Calvary, nothing can shake your faith, because that is the tie post of the soul. Outside of that, regardless of your sincerity, self-sacrifice and good works, you are lost (Romans 8:28-39). If you can see this revelation you will know you have been in the Logos from eternity. You are not forced to believe and you will not wonder, because faith dissolves all doubt and banishes confusion. Men make a grave mistake and forego faith when they take the Bible and Brother Branham for what they "say," rather than for what they "mean" (Matthew 18:16: II Corinthians 3:6). This practice has led many to imagine God is somehow three persons, and to baptize in three Titles when they have no Scriptural support for this heresy that was mandated by the First Nicaea Council of AD325 and enforced on pain of death. In these last days men are teaching a mélange of quotes from Brother Branham's sermons by which they claim to expound what they imagine to be hidden mysteries. They are in fact delivering the "letter" of THUS SAITH THE LORD coupled with the spirit of strong delusion, causing sincere, often fanatical persons with itching ears to accept their second-hand religion and be damned by it because they received not the love of the Truth (Acts 17:11; II Thessalonians 2:10-12). The Prophet's Message was sent as the Key to unlock eternal Life from the Bible. God's ministers are preaching end-time revelation from His Bible, not conjuring up "hidden mysteries" by reciting tea leaves of the "letter". I was speaking with a minister who wants to translate more Messages into his mother tongue. This is not the way. Besides which the world is falling apart, and it is far too late to organize the logistics. The Scriptural way is to receive a clear revelation of the present Truth and deliver it to the people from the Bible in their own tongue. They can "prove all things" from Genesis to Revelation personally in their own Bibles and "hold fast that which is good. The elect will then spread the Light by the acknowledged authority of the written Word of God. Millions of dollars and forty-three years have been spent translating and printing the "letter" of the Message: multitudes quote it verbatim, yet very few English-speaking believers have the revelation of what the Spirit is saying to the churches. By way of illustration, this diagram signifies the Eternal Spirit before creation alone with His thoughts. He is not the circle; He is the dots in the circle which represent His eternal thoughts. These are His Attributes and express His nature so that men may know, adore and glorify Him by growing into His Likeness. The fullness of His eternal thoughts was manifest as the Logos in theophany as the Tree of Life in the Garden of Eden, and as Melchisedec; then crucified in the virgin-born Jesus Messiah who was the fullness of God's nature and character expressed bodily in one Man. His elect, each written epistles of the Spirit in measure, are therefore accounted crucified in Christ on Calvary. Brother Branham spoke of these Attributes as the seed, germ, or gene of God. He also spoke of a nature and a soul. Some mistakenly equate these five terms, and taking the "letter without the Spirit" hypothesize that God's elect are born from mother's womb with the seed, gene or germ of God dormant in their heart. Quoting Ezekiel 18:4 they proclaim, "The soul that sins will surely die" and presume that when an elect is born-again the soul that sinned is annihilated and the dormant seed quickened into a sinless, spanking new replacement soul. But Jesus was sent to restore souls to fellowship through new birth, not to replace them. Had they taken the spoken Word of the Message to the written Word of the Bible as instructed they would never have conceived such fantasy. The "seed" is the incorruptible Word of God for OUR day received by faith through the foolishness of preaching to quicken our soul to Life in Christ (Luke 8:11; I Peter 1:22-25). When we were born from mother's womb, we were unable to speak let alone hear and understand the revealed Word of God. The Bible explains how our near Kinsman is redeeming that which was lost, NOT replacing it with something else. Your soul is you; your body is the temple in which YOU dwell, and your mortal spirit is the energy that powers your body and mind. Revelation 2:7, 11, 17, 26, "To him that overcomes I will give to fellowship with the Tree of Life (Jesus Christ), in the midst of the paradise of God. . . The soul that overcomes shall not be hurt of the second death." Hebrews 9:27, "It is appointed unto men once to die, but after this the judgment." The first death is the death of the body; the second death is that of the soul in the lake of Fire after the White Throne Judgment. As both are yet future the Two Soul theory is implausible (Ezekiel 18:4, 20; Revelation 20:14-15). As the famous medieval poet and philosopher Rabbi Judah Halevy explains in Kuzari, "Jewish people constitute a separate entity, a species unique in Creation, differing from nations in the same manner as man differs from the beast or the beast from the plant . . . although Jews are physically similar to all other men, yet they are endowed with a "second soul" that renders them a separate species" (Zimmer, Uriel, Torah-Judaism and the State of Israel, Congregation Kehillath Yaakov, Inc., NY, 5732 (1972), p. 12). "It is axiomatic in Cabalistic writings that the higher souls of Jewish people are derived from the divine pleroma (totality of divine powers)the realm of Sefirot (emanations)whereas the souls of all other nations are derived from the "shells." Rabbi Hayim Vital does not exempt converts from this rule (Aitz Hayim 7, 10, 7; Aitz Hadaat, Bemidbar). The "Tanya" of Rav Sheneur Zalman was written for the general public. Its view of Gentile souls is in Chapter 6. The Zohar follows the same line, save that in the Midrash Haneelam; we note a certain effort to account for this difference. Before Adam sinned, he possessed the higher soul; after his sin, only his animal soul remained. Thereafter, the divine soul comes only to those who are preoccupied with Torah, entering the body of the Jewish male at age thirteen" (Rabbi Jacob Agus, Meta-Myth: The Diaspora and Israel Zohar Hodosh, Bereshit 18b-19a, Midrash Hane'elam. Etan Levine [ed. ], Diaspora: Exile and the Jewish Condition, New York, Jason Aronson. 1983. p. 139). There is the doctrine of Two Souls. Christians should not be deceived into believing that when Jews speak of the Torah they mean the five Books of Moses. They do not. They refer to its antithesis, the Babylonian Talmud. Isaiah 53:10-11 exposes the heresy of Two Souls: "It pleased the Lord to bruise Messiah; He has put Him to grief. When His soul is made an offering for sin, He shall see His seed, He shall prolong His days, and the will of the Lord shall prosper in His hand. He shall see the fruit of the travail of His soul, and be satisfied: by His knowledge shall My righteous Servant (Jesus Messiah) justify many; for He shall bear their iniquities." Having borne our iniquities and carried away our sins as foreshadowed by the two goats in the ritual of Israel's day of Atonement, He has "by one offering sanctified and perfected forever" His new and living Temple made without hands, eternal in the heavens (II Corinthians 5:1; Hebrews 9:8-14; I Corinthians 3:16; 6:16). Having atoned with His innocent life Messiah cannot now lay any accusation against God's chosen souls whom He has justified (Romans 8:28-39; Hebrews 10:14)? It is Christ whose "soul was made an offering for sin." Were it possible for us to offer our soul for sin with the surety of a replacement we would be performing a program of self-works like Israel, making void God's grace by faith (Romans 9:30-33; Galatians 2:16; 3:2, 5, 10). Galatians 3:26-29, "For you are all the children of God by faith in Christ Jesus. For as many of you as have been baptized into Christ have put on Christ. . . And if you are Christ's, then are you Abraham's seed, and heirs according to the promise." Thus a second soul cannot derive from one's birth by a woman in the righteous lineage, or Cain would have had a spare. And not even by coition with a Jewess as implied by section 4B of Israel's unscriptural Law of Return (5710-1950), or Esau, Dathan, Korah, the Israelites who disbelieved at Kadesh, Judas Iscariot and those who were complicit in murdering Messiah all would have been elect of God. Quite apart from this, the social structure of Israelites and Christians of the Old and New Testaments is patriarchal. No one was ever born with Abraham's seed of faith, which comes by hearing and understanding the Word of God for your hour (Romans 10:17). God's children are not born of human intimacy but through faith in His revealed Word. "Abraham's seed" is the baptism with the Holy Spirit, which is the new birth. In summary, the seed, germ or gene of God is His thought, which when expressed becomes a Word, the revelation of which imparts His Spirit and eternal Life. 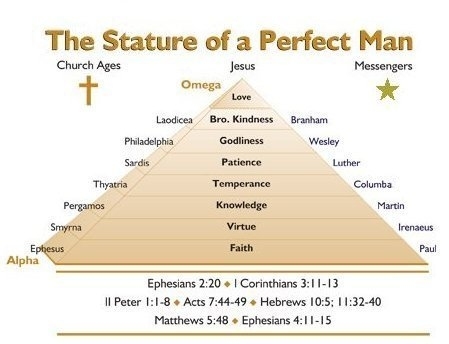 It becomes the Husband and one with our soul through the unity of the faith, and as "grace and peace are multiplied in us through the knowledge of God and of Jesus our Lord, we become partakers of the Divine nature" and manifest His Attributes, growing into the stature of the Perfect Man (II Peter 1:3-4). A "nature" is the sum of spiritual and physical qualities and propensities which make up the essential features and elements of character. It is the intrinsic disposition, inherent tendency or character of a person, object or being. The nature of a Christian is to have the Token on display. The nature of a dog is to bark at strangers, eat almost anything and bury bones. The nature of your car might be a reluctance to start. The nature of a mule is stubbornness. A theologian would classify the Two Souls heresy as a form of Manichaeism, a dualistic cult that postulates two natures have existed from the beginning: light and darkness. The realm of light lived in peace, while the realm of darkness was in constant conflict with itself. A nature is not a soul as Two Soul's believers assert but as Brother Branham and the Bible teach the soul is the nature of the spirit that controls it. Until your soul is born-again or quickened by agreement into union with the revealed Word for your day, your life cannot become a written epistle of that part of the Word, but is ruled by your mortal spirit and flesh whose desires are worldly. And as Satan is the Prince of this world his nature ultimately rules that unregenerate soul. Your soul reflects the nature of the spirit that is on it  the nature of the world, or the nature of the Holy Spirit. Whereas the spirit and flesh each have five senses, you, your soul has but one, faith or unbelief in the revealed Word of God as you determine by the exercise of your free moral agency. Your unregenerate soul was ruled by the nature of your mortal spirit, which is the nature of this world, and Satan is the god of this evil age. Your regenerated soul is ruled by the Word of God that has transformed the mortal spirit which now reflects the nature of Christ and brings your flesh subject to the Word. It is the nature on your soul that has changed; you are still the same old soul. The relationship established from Genesis to Revelation between male and female, husband and wife, is clearly seen where the soul, which is feminine in designation submits to and mirrors the nature of the spirit or husband to which it has yielded dominion. The feminine or wife is to be submissive and obey her husband in everything for she is his glory, or his shame, reflecting his nature and character. All souls come from God, even the souls of the Serpent's seed. Only the souls of Adam's race are written in the Book of Life, which is the genealogy of Adam, and have a kinsman Redeemer. Jesus Messiah is the last Adam; He was not the last Cain. Because of the fall, you, your soul was born into a house of corruptible flesha living spirit (Genesis 2:7) born dead in the sin of Eve and the trespasses of Adam, and ignorant and unlearned like your mortal spirit and baby flesh. What you learn will develop your nature. Initially this will be the experiences of the five senses of your bodysight, hearing, touch, taste and smell, and the five senses of your mortal spiritconscience, imagination, memory, reasoning and affection as they communicate a second hand account of their contact with the world. Depending upon your family nurture, cultural, educational and socioeconomic circumstances, these experiences can range from wholesome and good, even godly, to evil, and the communications from true to false. What you accept or reject will impose a sound or unsound nature on your soul, with a bearing on your future decisions as you exercise your free moral agency, forming your character and determining your destiny as a son of Adam. Too many of the wrong decisions will ultimately lead you, as it led Esau, Judas Iscariot and Caiaphas, to that place of no more repentance, and your name will be blotted from the Book of Life as spiritual Serpent's seed, whereas the correct decisions will sanctify and maintain your name on the Book of Life, and when you appeal at the White Throne Judgment you will be granted into eternal Life. None of this second-hand religion imparted by the worldly experiences of the ten senses, no matter how wholesome and godly, can quicken you your soul to eternal Life, for they are all "works" like Israel's Law. Faith alone, and faith in the present Truth, can quicken you to eternal Life (John 6:63; I John 1:7). The Spiritual Light of understanding revealed to you personally from the Father Above will kill that old worldly nature of enslavement to the desires of the mortal spirit and corruptible flesh, the "old man" that was in fornication with your soul. That old de facto husband is DEAD; now you are united with your new Husband, the Lord from heaven (Romans 7:1-6; I Corinthians 5:13-21; Colossians 3:1-11). You will not come under judgment but have passed from death unto Life as you are elect of God and your name was always in the Lamb's Book of Life. Homework: Please review Nature and Soul and Thy Seed shall inherit the Nations.